A tube of Voltaren® Gel (diclofenac), a commonly prescribed topical non-steroidal anti-inflammatory drug (NSAID), will cost a payer $60. Yet when it is packaged together with antibacterial wipes, its list price may be about nine times this cost, at $500. Convenience packs, or “co-packs” are not a new concept in workers’ compensation. However, there has been a significant uptick in these combination packs or kits as they relate to topical analgesics. The packs typically contain two or three products that are readily available individually, either over-the-counter or by prescription. Common combinations are a cream or a lotion paired with an oral agent. In another example, the lotion is paired with antiseptic wipes. In many cases there is a significant and unwarranted cost mark-up on these kits without any real additional value for the patient. With new kits becoming available on the market on a near-weekly basis, this marks a troubling and growing potential driver for claim costs. Identifying topical packs & kits can be challenging because they can show up in a claim in a variety of ways. They may be categorized based upon a single ingredient or product in the kit, such as a dermatologic, steroid or anti-inflammatory. In other instances, they could fall under a true private-label topical designation. 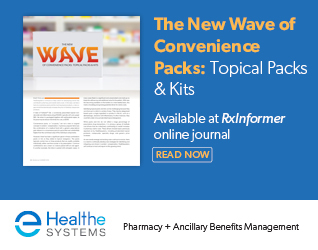 While packs and kits do not reflect a large percentage of transactions, they are among a group multiple cost drivers that are collectively contributing to overall increases in pharmacy claims costs. These drivers include topics previously reported on by Healthesystems, including private-label topical products, compounds, specialty drugs, and generic price increases. This content was originally published in the Summer 2016 issue of Healthesystems’ RxInformer clinical journal. To read more on other trending medical cost drivers in workers’ comp, visit www.healthesystems.com/rxinformer.